"... I think white is the most wonderful color of all, because within it one can find every color of the rainbow. The whiteness of white is never just white; it is almost always transformed by that which is changing; the sky, the clouds, the sun and the moon. " Richard Meier (born October 12, 1934) in Newark, New Jersey is an American architect known for his rationalist designs and the use of the colour white. Richard Meier earned a Bachelor of Architecture degree from Cornell University in 1957, worked for Skidmore, Owings and Merrill (Skidmore, Owings and Merrill ) briefly in 1959, and then for three years for Marcel Breuer. Meier was identified as one of The New York Five which refers to the group of five New York City architects (Peter Eisenman, Michael Graves, Charles Gwathmey, John Hejduk and Richard Meier) whose work appeared in a Museum of Modern Art exhibition organized by Arthur Drexler in 1967, and the subsequent book Five Architects in 1972. In 1963, he established his private practice, and working from his apartment, launched the business with a commission for his mother and father, a residence in Essex Fells, New Jersey. 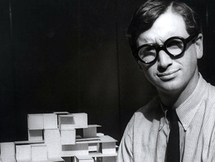 In 1965, one of his early residential commissions, Smith House in Darien, Connecticut propelled him into national prominence. Looking back on it now, Meier spoke of "the clarity of the building, the openness, the direct articulation of private and public spaces, how it relates to the land and water." He added, "It's been over 17 years, and what was innovative and captured a great many people's imagination and admiration then, is already a part of our language, and somewhat taken for granted today." Other commissions for private homes followed, along with some more public projects. In 1967, he began work on the conversion of the old Bell Telephone Laboratories in Manhattan's Greenwich Village to accommodate some 1200 people in 383 apartment units. The result was hailed in the architectural community as the first evidence that ultimately, Meier's greatest achievements might lie in larger-scaled more public works. "This too is an example of how quickly we assimilate," said Meier. "'The phrase, 'adaptive re-use,' wasn't even in the language then. We were really pioneering a new area." Much of Meier's work builds on the work of architects of the early to mid-20th century, especially that of Le Corbusier and, in particular, Le Corbusier's early phase. Meier expanded many ideas evident in Le Corbusier's work, particularly the Villa Savoye and the Swiss Pavilion. His work also reflects the influences of other designers such as Mies Van der Rohe and, in some instances, Frank Lloyd Wright and Luis Barragán (without the colour). He is especially well-known for his use of the colour white. White has been used in architectural landmark buildings throughout history, including cathedrals and the white-washed villages of the Mediterranean region, in Spain, southern Italy and Greece. In 1979, after devoting nearly five years of work to it, Meier completed another work, which prompted Ada Louise Huxtable to write in the New York Times, that the building advances "conventional modernist practice provocatively beyond established limits." The building referred to is known as The Atheneum, situated on the banks of the Wabash River in the restoration community of New Harmony, Indiana. 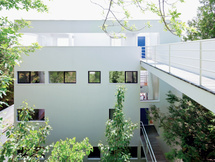 In 1984 Richard Meier was the youngest architect to receive his profession's highest accolade, the Pritzker Architecture Prize. Shortly after receiving that honour, he was awarded the commission to design The Getty Center, the Los Angeles art complex funded by the J. Paul Getty Trust. In 2008, he won the gold medal in architecture from the Academy of Arts and Letters and his work Jesolo Lido Village was awarded the Dedalo Minosse International Prize for commissioning a building. Meier is a Senior Fellow of the Design Futures Council. 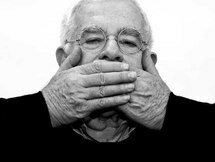 Meier is also the second cousin of the architect, theorist, and fellow member of The New York Five, Peter Eisenman.